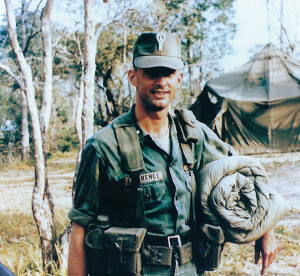 Twenty-four-year-old, 1st Lt. James Lawrence at his base camp in Vietnam, shortly before the battle of Landing Zone Albany. Lawrence, now 77, speaks with organziations and Soldiers about the lessons learned from the desperate fight in the Ia Drang Valley. 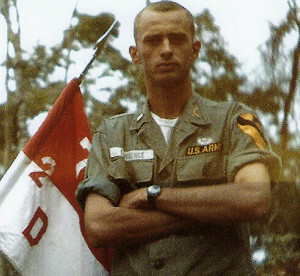 Lt. Don Cornett along with 154 Troopers from 2nd Battalion, 7th Cavalry Regiment were killed in the Ia Drang Valley, Nov. 17, 1965, at a small clearing known as Landing Zone Albany. He died less than 100 yards from where his best friend lay wounded. 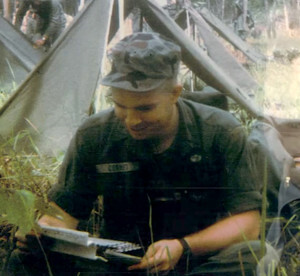 James Lawrence, a 77 year-old Vietnam veteran from Alabama, tells people about his best friend and the battle he died in whenever he gets the chance. Lawrence and Cornett were roommates at Infantry Officer Basic School, roommates in jump school and on the ship together that brought them to Vietnam. 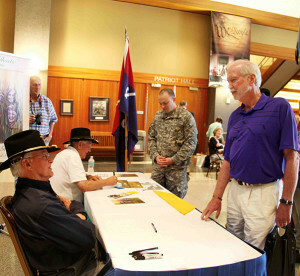 They were platoon leaders together in the 2nd Battalion, 7th Cavalry Regiment, 3rd Brigade, 1st Cavalry Division. They were promoted to first lieutenants at the same time and both became executive officers on the same day, Lawrence with Delta Company and Cornett with Charlie. 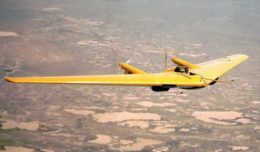 For Lawrence, telling the story of LZ Albany is not only a way to keep the memory of those who died alive, but also a way to educate others. He has written a book about his experiences and has spoken more than 20 times to veterans organizations, junior high and high school students, and civic groups. In 2016, he joined a panel of Ia Drang survivors at the Maneuver Center of Excellence, Fort Benning, Ga., to share their experiences with both young and seasoned officers and noncommissioned officers. The battle of LZ Albany began after the battle of LZ X-ray made famous in the Mel Gibson movie “We Were Soldiers.” The Troopers of 2/7 Cav relieved their sister unit, 1st Battalion, 7th Cavalry Regiment, on Nov. 16, following 1/7 Cav’s three day battle with the People’s Army of Vietnam near the base of the Chu Pong Massif. First Lt. Donald Cornett at his base camp in Vietnam, shortly before the battle of Landing Zone Albany where he was killed in action, Nov. 17, 1965. His friend, James Lawrence, speaks with organizations and Soldiers about the lessons learned from the desperate fight in the Ia Drang Valley. The column was strung out about 550 yards in the open with dense vegetation to their right. After about a three mile march, the front of the column reached the landing zone and the 2/7 Cav commander, Lt. Col. Robert McDade, called his company commanders forward to discuss how to best array their forces in preparation for extraction. They were unaware that two battalions of fresh PAVN soldiers had been camped out along the Ia Drang River on the other side of the landing zone. The men were still in an administrative maneuver, so when the word to halt came they plopped down where they were. Some of the men who hadn’t slept for close to 48 hours closed their eyes, others smoked or ate. No one pulled security. Lawrence dropped to the ground to take cover in the tall elephant grass and began to return fire like any other rifleman. He didn’t know that he was the one in charge at that time. The bullets missed his head by fractions of an inch, but the impact knocked him backward and he couldn’t move from the waist down. He was paralyzed. Later, after he was evacuated the doctors thought his spine was severed, but discovered later that he had a severely bruised spine from the force of the bullets whipping his head back. He would recover after some physical therapy and return to duty in 1966 to finish his tour. James Lawrence (foreground, left), author of “Reflections on LZ Albany:The Agony of Vietnam,” signs copies of his book at the National Infantry Museum in 2015. Lawrence speaks to organizations about his experiences in Vietnam and the lessons he learned. LZ Albany is essentially two clearings with a large copse of trees in the middle. Alpha company along with most of the command group had setup a perimeter in the trees, but the rest of the battalion was cut off. Lawrence, even in his paralyzed state, was able to give some direction to his company. Somebody grabbed him under his arms and dragged him toward the trees, but dropped him in the clearing where air support was dropping napalm. He knew he had to get out of the clearing, so he started pulling himself along the ground using only his arms, when someone grabbed him and dragged him the rest of the way into the trees. He spent that night among the dead and wounded. He was medically evacuated the next morning. He did not know at the time that his friend, Don Cornett, had died. In a 1967 article for the Saturday Evening Post, former ABC reporter Jack Smith, who was a private first class in Charlie Company during the battle, wrote about Cornett’s last moments. “The XO let out a low moan, and his head sank. I felt a flash of panic. I had been assuming that he would get us out of this. Enlisted men may scoff at officers back in the billets but when the fighting begins, the men automatically become dependent upon them. Now I felt terribly alone. The bulk of the fighting lasted about six hours and in that time 2/7 Cav lost 155 killed and 124 wounded. The single, bloodiest day in the Vietnam War. Initially, Lawrence’s thoughts and feelings after he was safe were just moments captured in his mind. It wasn’t until about two weeks later, as he read Stars and Stripes, that it hit him what he had survived. The late Lt. Gen. Hal Moore, author of We Were Soldiers Once … and Young, is said to have closed every speech with the phrase, “Hate the war, love the American warrior.” That is the theme of Lawrence’s book and of his talks. For him, war is something that will always be a necessity as long as there is evil in the world, but it is something that is not to be glorified or desired. He shares this message with the groups he speaks to, but being able to impart some wisdom and knowledge from his experiences to Soldiers is special to him, because for him it is an opportunity to maybe bring a Soldier home safely. Twenty-four-year-old, 1st Lt. James Lawrence at his base camp in Vietnam, shortly before the battle of Landing Zone Albany. Lawrence, now 77, speaks with organizations and Soldiers about the lessons learned from the desperate fight in the Ia Drang Valley. Jim also talks about the failure of leadership. From the lack of training and understanding of the situation to the haphazard way they conducted their movement and their halt. He is brutally honest, even with his actions as a leader. Lawrence’s story is one that he has told so often to so many people that it is fluid and impactful without being rehearsed. It is laced with hard facts, observations, anger, sadness and even some humor. Although each survivor’s story is unique, they all carry the same lessons. Lessons in leadership, in the importance of training, in courage, in sacrifice and in loss. He tells his audience this to help them understand. Don Cornett had a wife and a son, a mother and a father and two sisters. The other 58,000 names on that wall are men and women who also had a spouse, or children, they had mothers and fathers, brothers and sisters. They are all Don Cornett to him, his best friend. In the same way, the story of his experiences at LZ Albany is a story that could be told by the nearly 400 Troopers of 2/7 Cav who fought and died at LZ Albany, or the 1/7 Cav Troopers at LZ X-ray or the more than 2.6 million US personnel who served in Vietnam. They are stories that not only serve to maintain our connection with history, but also educate us and force us to confront the good and the bad and learn from it.